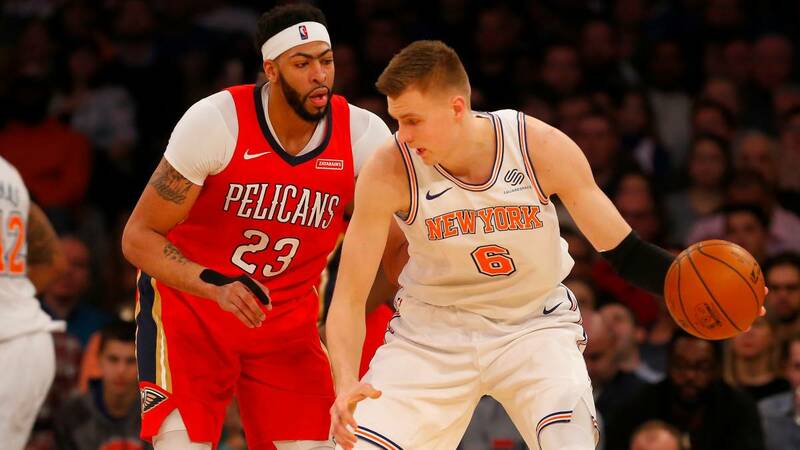 The New York franchise is also preparing an offer to convince the Pelicans that Porzingis would almost certainly enter. Chris Haynes, Yahoo Sports, has published several issues related to the possible transfer of Anthony Davis that are giving a lot to talk about in the United States. Apart from saying that the power forward did not want to go to Boston because he believes that Kyrie Irving may not renew his contract at the end of the season, he also points to a possible competitor of the Lakers for the signing of the player of the Pelicans. Ese team not it would be other than the New York Knicks, who seem willing to wage war on the Los Angeles franchise in the fight for Davis. Those in the Big Apple would also be moving their cards and the main one of all would be Kristaps Porzingis. The Latvian, who is still out due to the knee injury that was made in early 2018, would be the big claim to convince the Pelicans to reach an agreement. The fact is that Porzingis has been a couple of years in a strange relationship with your franchise. Since the problems with Phil Jackson the trust between both parts seems to have suffered and the long-term injury in which he is immersed has not helped. Last summer the Knicks had the option of offering their center a renewal as a designated player, as he entered his fourth year since he was chosen in the draft. But the doubts about his physical condition threw back the franchise. Other teams in the league did sign large contracts at that time to players in the same situation as Latvian, such as the Suns with Booker or the Wolves with Towns. Subsequently from the franchise has been indicated that the intention is to renew him when he finishes this season. But then it will not depend only on them, since they would have to match any offer that came from other teams. In addition, in his recovery process have been crossed messages between the coach of the Knicks, David Fizdale, and the player, who do not seem to agree on the current state of his physique. Fizdale has said he will not play in the remainder of the course and Porzingis does not seem happy with that decision because he believes it will be ready before April. The truth is that all these misunderstandings, which cause an unstable climate around the figure of the player, they would disappear if he went to another team. Although to square salaries the Knicks have to include one of the two major contracts they have on the payroll: Enes Kanter (18 million) or Tim Hardaway Jr. (17 million) . Added to the 5 million Porzingis would be very close to the 25 that Anthony Davis charges. With some round of draft could be a beneficial agreement for both parties. Puesto to choose between the two players, for the Knicks would be much more interesting to put in the pack Hardaway Jr., which still has two more years of contract, the second with player option. Kanter is in his last year and in summer he would leave anyway. This way they would save more than 30 million, which would allow them to go in free agency to another star. And Kyrie Irving (the rumors about his future in the Knicks are not new) or Kemba Walker seems to be his two priority goals. While either of the two bases is on the Knicks' agenda, whether or not Anthony Davis arrives. Because in case the transfer of the Pelicans is not carried out, the New Yorkers would continue with their initial plan, which is to offer the keys of the city to Kevin Durant. Until the Davis earthquake, the great one desired in the Big Apple.